An organ transplant is often a patient's last hope for life, and it is well known that there are an insufficient number of organs being donated from living or deceased donors. The wealthy always have the option of avoiding long waiting lists by finding quasi legal organs for sale within and outside the US. 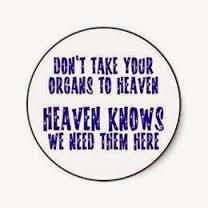 For the rest of us, it could take years to get an organ transplant. There is an urgent need and we must investigate how to best increase the donor pool. Approximately 18 people die every day - more than 6,000 a year - due to a shortage of donated organs, and the lack of organs for transplant will continue to rise as the population ages. 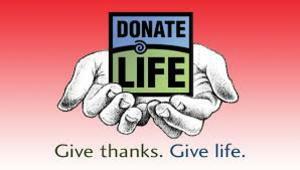 While people die in need, one person can save or enhance the lives of up to 50 other people through organ and tissue donation, according to Gift of Life. No one is too old or too young [to donate]. Both newborns and senior citizens have been organ donors. The condition of your organs is more important than age. Someone 35 years old with a history of alcohol abuse may have a liver that is in worse condition than someone 60 years old who has never consumed alcohol. Doctors will examine your organs and determine whether they are suitable for donation if the situation arises. If you are under 18, you may need the permission of a parent or guardian to donate. The most common organ transplanted is the kidney, which unlike the liver and heart, can be donated from either a deceased or living donor. Live donors - usually relatives -can lead a fully active life with one kidney. Recipients generally have End State Renal Disease (ESRD) which means that both of their kidneys have failed. Life expectancy on dialysis can vary depending on the patient's age, other medical conditions and how well the patient follows his or her treatment plan. Average life expectancy on dialysis is 5 to10 years; however, many patients have lived well on dialysis for 20 or even 30 years. In 1972 the Social Security Act granted comprehensive coverage under Medicare to virtually anyone diagnosed with kidney failure, regardless of age or income. The average person with failed kidneys remains on the transplant waitlist for 3 to 5 years. In the meantime, they're hooked up to dialysis machines several times a week at an annual cost of approximately $75,000. Kidney transplant surgeries typically pay for themselves within one to three years because the need for dialysis is eliminated by the new kidney. With approximately 400,000 Americans relying on kidney dialysis, taxpayers spend more than $20 billion a year to increase each patient's life an average of three years. Kidney failure disproportionately afflicts minorities and the dispossessed, including prisoners, who rely on Medicare and Medicaid. As of 2010, the US continues to have one of the industrialized world's highest mortality rates for dialysis care. Two corporate chains that dominate the dialysis-care system are consistently profitable, together making about $2 billion in operating profits a year. One of these, DaVita HealthCare Partners, agreed to pay $350 million to settle criminal and civil anti-kickback investigations and plans to end joint ventures with kidney doctors involving 28 dialysis clinics. Two major systems are used to acquire organ donations. 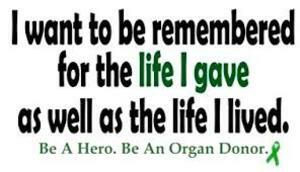 Opt-in works by having citizens register their willingness to be an organ donor upon their death. 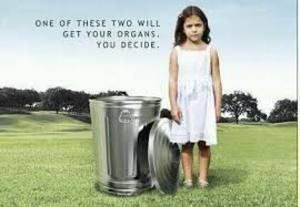 Opt-out operates by all citizens being donors upon their death unless a specific request is made before death for organs not to be taken. Opt-in, as we have in America, it is argued, can lead to individuals who would want to be a donor not making the official step to register as a donor. In contrast, inaction in an opt-out system can potentially lead to an individual that does not want to donate becoming a donor. It seems logical that opt-out would generate more donors. The theory was investigated by researchers from the Universities of Nottingham, Stirling and Northumbria in the UK, who looked at 48 nations' organ donation policies to determine whether opt-in or opt-out yielded better results. The results of their research were published in BC Medicine in 2014. Slightly less than half the nations (23) use an opt-in system, including the US, Canada, Mexico, The Netherlands, Israel, Japan and New Zealand. Slightly more than half (25) have opt-out polices, including France, Italy, Spain, Sweden, and Russia. It is also known as presumed consent. The UK study found deceased donor rates were higher in opt-out than in opt-in consent countries. However, the number of living donors was higher in opt-in than opt-out nations. The authors also note that countries using opt-out consent still experience organ donor shortages. Changing the system of consent is, therefore, unlikely to solve such a problem, according to James McIntosh of Medicine News Today. The US utilizes Opt-in with registration when people obtain drivers licenses, and there is an option to register online. This system excludes tens of millions of people such as the impoverished and/or disabled who do not drive and have no access to online registration, as well as prisoners. replacing g our opt-in with an opt-out system might do more to increase donations here in the US than it has in other countries. Both opt-in an opt-out only provide organs from deceased donors. Most live donations of organs such as kidneys are obtained from relatives. In order to increase these "donations," some suggest allowing financial incentives or the sale of organs. [The] libertarian-minded argue that if our bodies are ours to manage, it should follow that we are also able to sell our organs. They argue that the financial incentive will increase the supply of live donors so significantly, it will eliminate the market shortage. 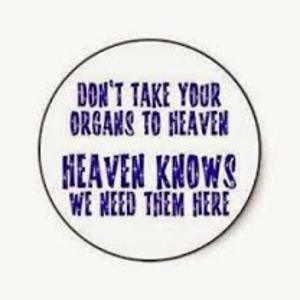 The libertarians argue that organ sales - not presumed consent, which they claim not only violates personal freedom, but also is ineffectual over the long run - is the answer. There's a certain logic to their thinking. We don't expect altruism to drive markets in most other aspects of our daily lives. Opponents of this view argue that creating a free market for kidneys would be exploitative and immoral, noting that the poor of Pakistan and China have shown willingness to sell corneas on the black market for money. A market system - black or otherwise - the opposition fears, exploits such abject poverty. Clark and Clark counter this argument by noting that people take high risk jobs such as working in mines or joining the military for the money. Whether we like it or not, we live in the era of globalization, and if the U.S. legalizes the market for body parts, there is no reason to think that international economies won't play a role in how a patient decides to procure transplant organs. According to the National Foundation for Transplants, a kidney transplant costs about $260,000. In the illegal organ markets in India, Egypt and Pakistan, the same procedure rings in at just shy of $20,000 -- certified organ included. Those opposed argue that allowing organs to be sold would favor wealthy recipients and leave less affluent patients closed out, as opposed to following the current criteria regarding the patient's state of health and age, among other considerations, and putting price tags on organs. There is also very real concern about human trafficking for organ harvesting. In the early 1980s a new form of human trafficking, a global trade in kidneys from living persons to supply the needs and demands of 'transplant tourists', emerged in the Middle East, Latin America and Asia. The first scientific report on the phenomenon, published in The Lancet in 1990, documented the transplant odysseys of 131 renal patients from three dialysis units in the United Arab Emirates and Oman. They travelled with their private doctors to Bombay (now Mumbai), India, where they were transplanted with kidneys from living 'suppliers' organized by local brokers trolling slums and shantytowns. The sellers were paid between $2,000 and $3,000 for a 'spare' organ. On return, these transplant tourists suffered an alarming rate of post-operative complications and mortalities resulting from mismatched organs, and infections including HIV and Hepatitis C. There was no data on, or discussion of, the possible adverse effects on the kidney sellers, who were still an invisible population of anonymous supplier bodies, similar to deceased donors. Nancy Scheper-Hughes, who co-founded OrgansWatch, says that it is no longer a questions of medical ethics; it is international organized crime. Legalizing it might add some protections and regulations, but will do little to minimize the exploitation of the poor. Spain's organ transplant program is hailed as a successful model. At the end of 1989, the Organización Nacional de Trasplantes (ONT) was created within the Spanish Department of Health, which is in charge of official reports in the field of organ donation and transplantation, and it guarantees the complete equity and transparency of the system. Hospitals in Spain - the vast majority of which are governmental; not private - have transplant coordinators whose role is to identify potential donors and effectively convert them into actual donors with the consent of family. The success of organ transplants in Spain is attributed mainly to the sensitive way transplant coordinators approach the bereaved families. Italy and Portugal have followed suit, putting in place a similar system of transplant coordinators, and their organ donation rates are also on the rise. Several other European nations, including Britain, are now considering doing likewise. Israel and Singapore have found a unique way to motivate and encourage organ donations that does not involve financial incentive. It is called Allocation Priority or Priority Rule and here is how it works: People who agree to be donors when they die, or "in various ways support organ donation" for at least three years before being listed as in need of an organ donation, are given priority should they need a transplant. This law has had success in Israel in conjunction with opt-in, particularly because there is a portion of the population that is opposed to donation for religious reasons, but nevertheless seek a transplant when it is necessary to save their lives. Americans could very well benefit by adding to our current opt-in system the Israeli priority model that incentivizes opting in. States might also initiate legislation or place ballot initiatives to let voters decide if they would support an opt-out system. These measures are far more equitable than resorting to harvesting and selling organs, which opens the door to corruption and exploitation. Such changes could save lives and save tax payers money.